Welcome to the Middleton-Cross Plains Middle School Advanced Learning Website! 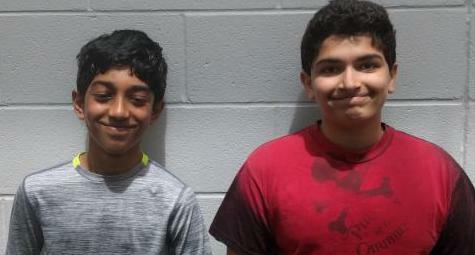 Congratulations to Kromrey 6th grader Harry Jin and Glacier Creek 8th grader Aditya Kamat who have both qualified for the State Geo Bee! Good luck Harry and Aditya! 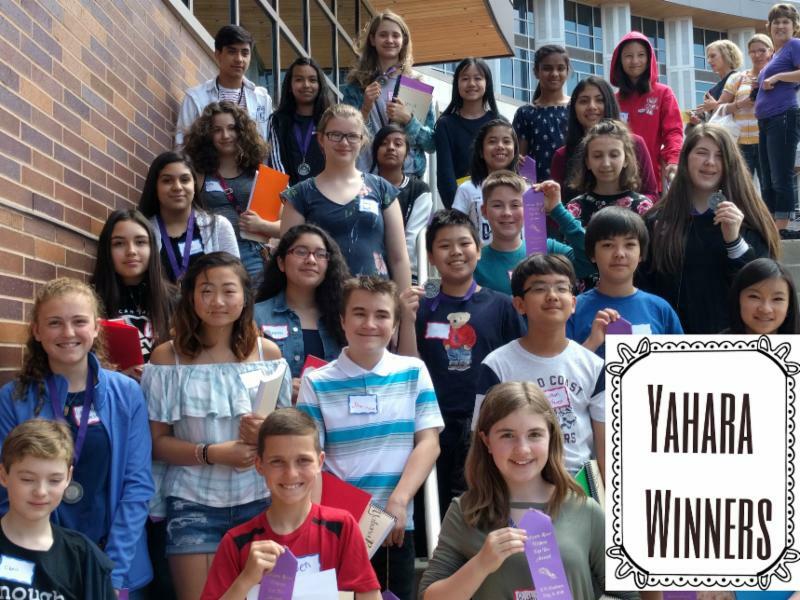 Yahara River Writing Contest Winners! Congratulations to the following middle school students whose work has been selected by the Yahara River Writers Contest. These students placed in the top 10 for English poetry, short story, editorial, cartoon, Spanish poetry, cover or dividers. This contest includes thousands of students from all over southern Wisconsin. All 35 of our winners will be invited to attend the Top 10 Writers Workshop and Awards Ceremony on Tuesday, May 14 at the Union South on the UW-Madison campus. Special thanks to all the district literacy teachers who encouraged students to create work for this opportunity! Special thanks to Math 24 Club advisors Emily Stousland, Brett Batura, Jenna Degner, Diane Boles and Jen Sadkovich, and to all the parents who helped out with this event. The District Math Meets were held on March 4 and 5 at the Hilton Garden Inn in Middleton. 120 students participated each day. 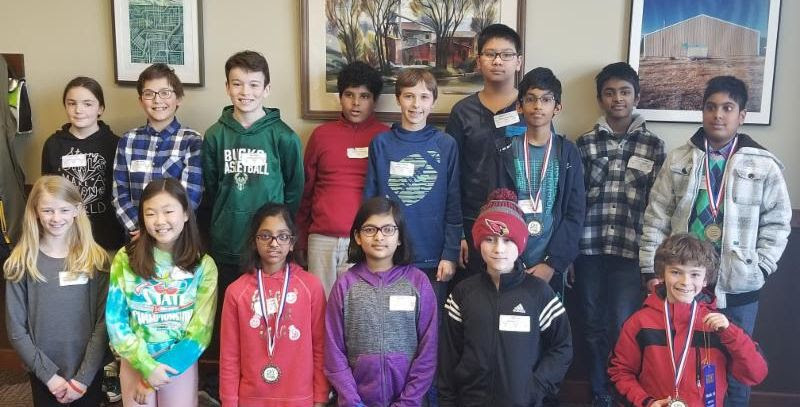 The top 12 finishers individually advance to the Regional Math Meets in April and from there they may qualify for the Mega Math Meets in May. On Monday, March 4 at the 5th/6th grade meet, the following students placed in the top 12 + 2 alternates. 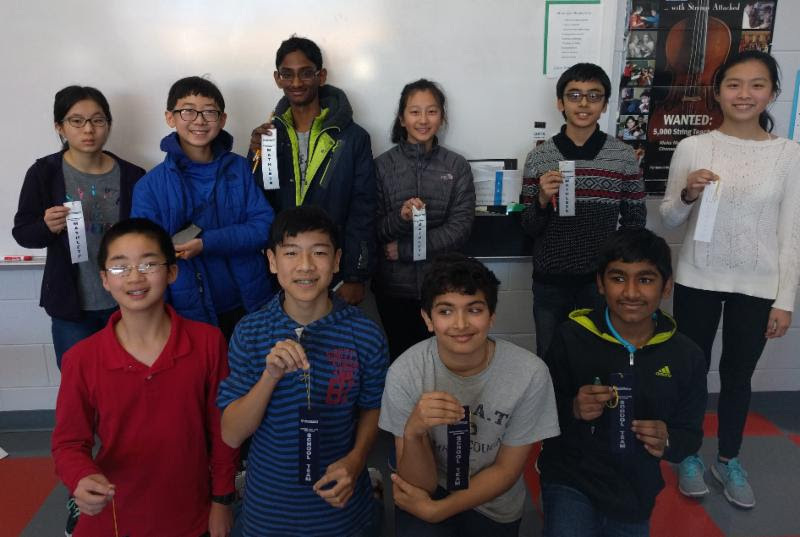 6th graders - Ethan Bo, Harry Jin, Rishika Kommuri, Lucas Kurtz, Akshay Manna, Venkat Peddinti, Shreya Ramesh, Ethan Sanders, Jonathan Schecher, Owen Weisenberger, Li Ying,Kevin Zhang, Luke Zhang & Ryan Zhu. The 5th/6th grade Regional Math Meet will be held on Wednesday, April 24 at Kromrey Middle School and will include teams from Sun Prairie, Verona and Madison too. On Tuesday, March 5 at the 7th/8th grade meet, the following students placed in the top 12 + 2 alternates. The 7th/8th grade Regional Math Meet will be held on Thursday, April 25 at Kromrey Middle School and will also include teams from Sun Prairie, Verona and Madison. Good luck teams! Special thanks to teachers Jen Sadkovich, Diane Boles, Emily Stousland, Amy Weber, Tanya Thuesen, Catherine Bartzen, Sonja Hungness, Marlene Feinstein, Brian Stubbe and MHS student explainers Meghna Datta and Rupa Ballamudi. Also THANK YOU to the many parents who helped proctor and score for the meets! The Wisconsin Future Problem Solving Program will hold its 39th annual State Bowl in Green Lake from April 11-13. Hundreds of fourth through twelfth graders from around the state will participate in the Global Issues Problem Solving competition at the State Bowl. Working in teams of four or as individuals, students will analyze the challenges and develop solution ideas for a situation set in a fictional future and related to the global topic of Coping with Stress. Additionally some students wrote "Scenarios" - these are short stories set in the future that are based on one of the topics. Global Issues Problem Solving, a component of the Future Problem Solving Program International, is an educational program in which students learn a six-step problem solving process and apply it to future situations in three practice topics they have researched. The practice topics this year were Mission to Moon, Mars and Beyond, Drones, and Food Loss and Waste.The goals of the program are to encourage students to become more creative in their thinking, to develop richer images of the future, to increase their research skills, to learn cooperative teamwork skills, and to increase their written and verbal communication skills. At the State Bowl, Global Issues Problem Solvers will brainstorm 16 challenges, an underlying problem, and 16 solutions for a future situation. They will also develop criteria to use in selecting the best solution, and write an action plan for implementing it. This written team effort is completed in a two-hour time frame. In addition, students will plan and present four-minute presentations to introduce their best solution action plan to an audience. *Grade 5 students are eligible if they are attending a middle school along with grades 6 through 8 students. The Middleton-Cross Plains School District does not directly sponsor or endorse the community opportunities listed here. If you have questions about any of the district events, please contact the advanced learning specialist at your school - names and phone numbers are listed on this page. Congratulations to the following students who placed in the top 10 for the Yahara River Writers Contest and attended a special ceremony at the Union South on the UW-Madison Campus on Tuesday, May 8th. These students wrote poems, short stories, editorials or created cartoons or other art work for divider pages. For the first time this year, Spanish poetry was also included as another submission category. Thousands of students from all over southern Wisconsin submitted work so these students should be especially proud of this accomplishment! Special thanks to teachers Amy Weber, Molly Tormey, Melanie Chanos, Carrie Murphy, Kodie Johnson, Damaris Falcon, Lindsey Harmon, Diane Boles & Emily Stousland for helping with this event and to all the district literacy teachers who encourage students to create submissions for this contest. Sixteen district 7th and 8th graders advanced to the Mega Math Meet on May 23rd at Madison College. Our teams placed 2nd and 3rd and one of our students, Glacier Creek 8th grader Harsha Chilakapati, placed 3rd individually. Thanks to math teachers Erin Bares & Marlene Feinstein for coming and helping out with this meet, and to all the district math teachers who help challenge students every day! 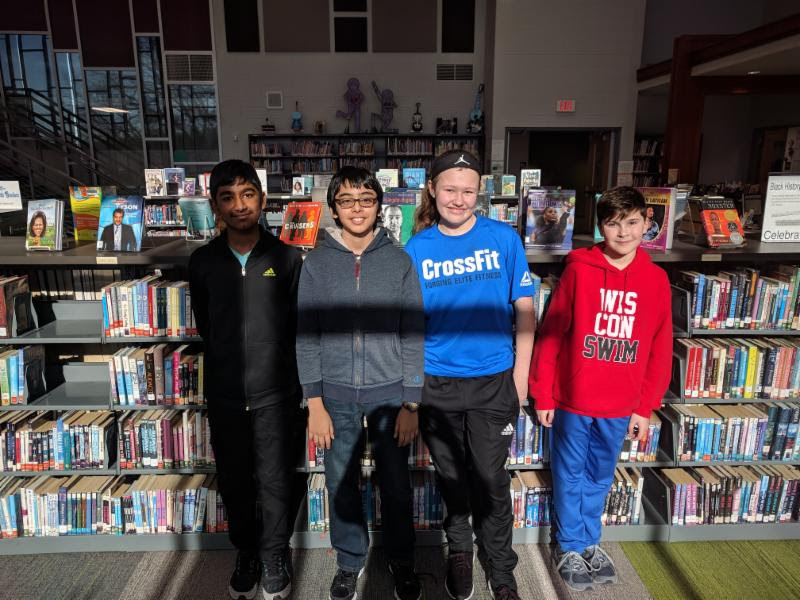 Good luck to the five district students who have advanced to the Future Problems Solvers International Conference to be held at the UW-LaCrosse on June 7-10th. These students include: KMS 7th graders Maddie Goscha, Zaki Siraj, Gus Balasubramaniam and Jonathan Kim, + MHS 9th grader Nikki Yu. Each year the Engineer Girl organization sponsors various programs including a writing contest. This year's contest asked students to imagine how engineering can help communities. Specifically, this year's contest focused on having students investigate an infrastructure system in our community and suggest an improvement in the form of a persuasive letter, essay or report. Congratulations to Glacier Creek 7th grader Mackenzie Sloanwhose essay titled, "The Future of Student Safety" was named as a finalist. The Wisconsin Educational Media and Technology Association (WEMTA) sponsors a statewide Battle of the Books program for students every year. Battle of the Books is a fun, academic-based competition that has been very successful in school districts throughout the state in encouraging students to read and expose them to a variety of authors. WEMTA sponsors three divisions. The elementary division reads the nominated Golden Archer winners for the primary and intermediate levels plus a variety of other award winning titles. The middle level participants read the nominated titles for the intermediate and junior high level plus ten other titles which are determined by media specialists throughout the state. The senior division reading list aims to expose students to current award winning literature. The list incorporates awards such as: Golden Archer, Newbery, Printz, Siebert and others. 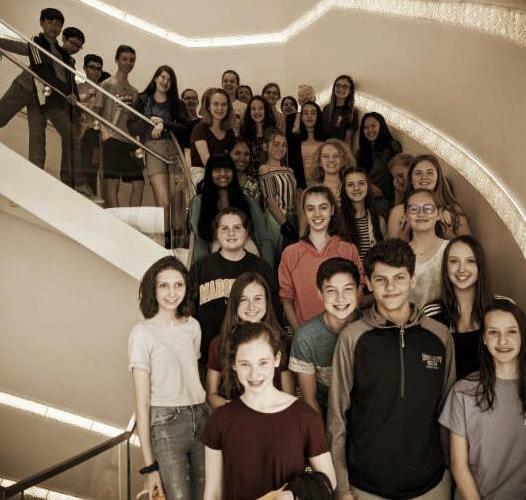 Taylor Nordeng, center front above, was one of seven Dane County middle and high school student playwrights whose work was performed by local, professional actors at a recent Playwright Festival at the Overture Center. Nordeng's play, "Uprooted," was the area's winning middle school level play for Children's Theater of Madison's (CTM)Young Playwrights for Change competition. CTM partners with the American Alliance for Theater & Education to offer students the chance to submit their plays to the national Young Playwrights for Change. This year's theme was Rise Up: Fighting for Love and Inclusion in the Face of Hatred and Bigotry. Because her play was selected as the winning entry, Nordeng had the opportunity to work with CTM staff and directors to bring her script to life on stage for two performances at the Young Playwrights Festival on May 2nd. Four other Kromrey Middle School 8th graders received special recognition for their play scripts, including Daphne Wu, Catie Harris, Liliana Roden and Franklin Hu. Several other plays written by Kromrey 8th graders were selected to move on for consideration in the CTM Young Playwrights' experience. These students (pictured above) include Elora Doxtater, Lexi Lund, Maya Lemke, Cate Ohly, Emily Tsipis, Maeve McGinley, Avery Brutosky, Julia Torresani, Christie Munson, Eli Kinne, Michael Lee, Janice Peng, Fei Smith, Griffin Ward, Cecilia Kasper, Evelyn Williams, Emily Lynch, Prisha Rajesh, Ivan Chairz-Lomas, Blaise Lin, Daniel Lee, Arturo Tamayo-Jimenez, Anna Kessenich, Noah Lorman, Alynn McLeod, Joshua Sampson, Cheyenne Halverson, Rowan Hansen, and Kaitlyn Narman. Special thanks to all of the staff who guided students through the project, including Jean Holman, Marah Larsen, Ruth Frawley and Marisha Ashe. Sixteen district 5th and 6th graders advanced to the Mega Math Meet this week at UW-Madison. One of our two teams won the meet! This team included: Jonathan Schecher, Nikhil Quintin, Harry Jin, Ray Feinberg, Grace Wo, Kevin Wu, Raghav Gopalakrishnan and Roddy McLellan. Additionally Kromrey 6th grader, Grace Wu, placed 3rd overall individually at the meet. Congratulations students! Special thanks to teachers Sonja Hungness, Jenna Degner, Courtney Ibinger and Ashley Longino, for helping out with these meets to all the math teachers who work to challenge students every day! The Madison Area Science, Technology & Engineering Rising Stars (MASTERS) program was established to provide middle school students (grades 6-8) the opportunity to showcase their research and explorations in STEM subjects. Private, public, and home school students are eligible. This year's fair was held on Sunday, May 6th, in Madison, again at the Eagle Heights Community Center. The goal of the fair is to inspire enthusiasm for science and engineering research and exploration among Wisconsin students. It provides a support system to assist students as they actively participate in science and engineering endeavors. Two Kromrey student did very well! Sanjay's project explored the use of 3-D printing for creating violin bridges. Raghav's project focused on sorters and how they work based on the weight and size of the objects being sorted. There were 20 projects presented by middle-schoolers from around the Madison area. Invitations have been handed out to all Kromrey and Glacier Creek students who have work published in our school literary magazines - The Gallery at Kromrey and In Black & White at Glacier Creek. All of these students should plan to attend special Fine Arts Nights celebrations. Kromrey's event starts at 6:00 p.m.
Glacier Creek's event starts at 7:30 p.m. Published students should try to arrive a few minutes early to check in and pick up their copy of the magazine. These evening events will include chorus performances and a celebration of student writing and art. Kromery 8th grader Hansen Jin who won the State Geo Bee on Friday, April 6th. He will represent Kromrey and Wisconsin at the National Geo Bee May 20-23 in Washington D.C.! This year 99 students from Glacier Creek, Kromrey and Middleton High School qualified and attended the Future Problem Solvers State Bowl which was held on April 12-14 at the Green Lake Conference Center in Green Lake, WI. Sadly the weather did not cooperate and many events were cancelled. Students went up to Green Lake on Thursday, but then had to return home late Friday due to impending sleet, snow and ice. As the photo above demonstrates, students are to be commended being so positive throughout a disappointing State Bowl. Kromrey Team - Gus Balasubramanaim, Jonathan Kim, Zaki Siraj and Maddie Goscha who placed 4th and will advance. Also congratulations to Nikki Yu who placed 1st and is attending IC. One other team of high school senior also placed 1st but can not attend IC. This team includes Balaji Veeramani, Haiwen Dai, Nick Spevacek and Nick DeOliveira. One other student was recognized at the FPS State Bowl. Middleton High School senior Kirstin Yu received the Jennifer Hanson Student FPS Award for her work developing the FPS Program at MHS. Kirstin has worked closely with other coaches in our district to provide resources and coordinate the nuts and bolts of registering and submitting booklets for the high school teams. Her leadership has made it possible for many students to continue to participate in 9th - 12th grade. Congratulations Kirstin! Kim Munson, Cortney Spots, Joleen Feltz, Dharani Kanagala, Andy Inman, Vamsi Kommuri, Stacey Bohachek, Reena Mallannagari, Chantel Greenberg, Bunjin Lee, Kristen Haag, Andy Lyons, Newrhee Kim, Serena Yu, Charles Yu, Suzanna Chau, Oh Hoon Kwon, Meghna Kuckreja, Rhonda Gessler, Deepa Gouraram and Anita Wang. Future Problem Solving is coached by Ruth Frawley for Glacier Creek & Kromrey's middle teams, Julie Rozanski at Kromrey with the junior teams and John Niesen at Middleton High School. Teams of 8th grade editors are working to create school literary magazines at both Glacier Creek and Kromrey. Many middle level students have submitted work to these and will receive invitations to our Fine Arts Nights by mid-May if their work has been selected to be published. Published students should try to arrive a few minutes early to check in and pick up their copy of the magazine. These evening events will include chorus performances and a celebration of student writing and art. Special thanks to teachers Alex Arndt, Jay Larson, Brett Batura, Preston Rodriguez, Jen Sadkovich, Diane Boles and Emily Stousland for all their work with these students and to all the parent volunteers who helped with the event! The Wisconsin Future Problem Solving Program will hold its 38th annual State Bowl in Green Lake from April 12-14, 2018. Hundreds of fourth through twelfth graders from around the state will participate in the Global Issues Problem Solving competition at the State Bowl. Working in teams of four or as individuals, students will analyze the challenges and develop solution ideas for a situation set in a fictional future and related to the global topic of Cloud Storage. Additionally some students wrote "Scenarios" - these are short stories set in the future that are based on one of the topics. Global Issues Problem Solving, a component of the Future Problem Solving Program International, is an educational program in which students learn a six-step problem solving process and apply it to future situations in three practice topics they have researched. The practice topics this year were the Spread of Infectious Disease, Toxic Materials and Philanthrocapitalism. The goals of the program are to encourage students to become more creative in their thinking, to develop richer images of the future, to increase their research skills, to learn cooperative teamwork skills, and to increase their written and verbal communication skills. The District Math Meets were held on March 12 and 13 at the Hilton Garden Inn in Middleton. 120 students participated each day. 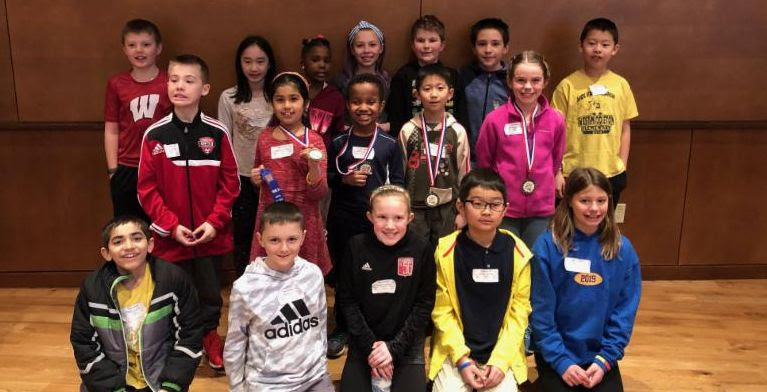 The top 12 finishers individually advance to the Regional Math Meets in April and from there they may qualify for the Mega Math Meets in May. On Monday, March 12 at the 5th/6th grade meet, the following students placed in the top 12 + 2 alternates. 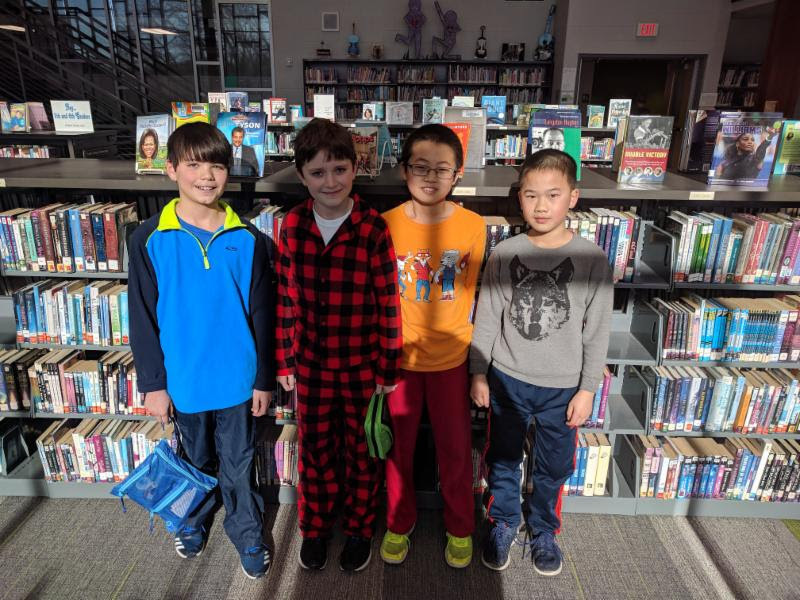 5th graders - Jonathan Schecher, Nikhil Quintin, Harry Jin, Ray Feinberg, Li Ying, Vincent Li, Ethan Bo, Venakt Peddinti, Luke Zhang, Liev Schiffman, Owen Weisenberger, Abby Sanger, Alina Wisinski and Selina Wen. 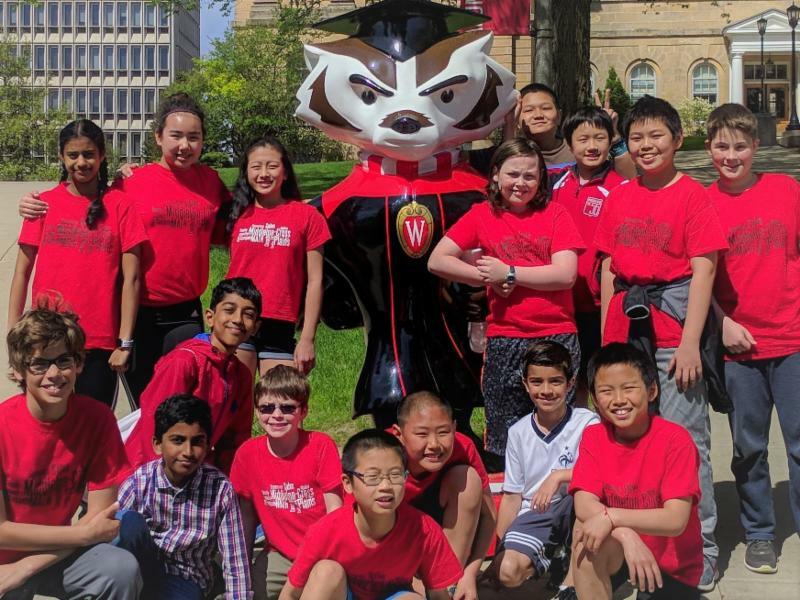 6th graders - Grace Wu, Kevin Wu, Raghav Gopalakrishnan, Roddy McLellan, Alexa Garber, Ian Lam, Amritha Mavuri, Ben Pralat, Aadil Ahmad, Miles Wagener, Henry Dickenson, Isha Chilukuri, Eric Ma and Piper Garcia Hall. The 5th/6th grade Regional Math Meet will be held on Wednesday, April 25 at Kromrey Middle School and will include teams from Sun Prairie, Verona and Madison too. On Tuesday, March 13 at the 7th/8th grade meet, the following students placed in the top 12 + 2 alternates. 7th Graders - Caleb Sanders, Kaitlyn Ko, Krish Parikh, Naveed Ansari, Biagio Gargano, Dheeraj Pasikanti, Nihar Ballamudi, Josh Chen, Teddy Burkard, Lauren Li, Zaki Siraj, Dhruv Prakash, Flynn Ewer and Aaron Dunk. 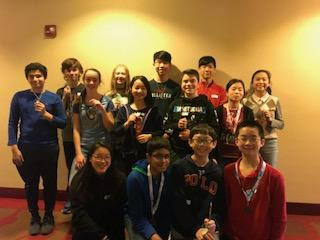 8th Graders - Hansen Jin, Amanda Zhu, Harsha Chilakapati, Franklin Hu, Daphne Wu, Sanjay Suresh, Ethan Hellenbrand, Cheyenne Halverson, Michael Lee, Annabelle Reppen, Clay Kaufman, David Ma, Seoyoung Min and Katy Bouril. The 7th/8th grade Regional Math Meet will be held on Thursday, April 26 at Kromrey Middle School and will also include teams from Sun Prairie, Verona and Madison. Good luck teams! Special thanks to teachers Jen Sadkovich, Diane Boles, Emily Stousland, Amy Weber, Sue Brumm, Tanya Thuesen, Amy Imoehl, Jenna Degner, Carrie Murphy, Sonja Hungness, Jay Larson, Ashley Longino, Marlene Feinstein, Damon Piscitelli, Brian Stubbe and MHS student explainers Meghna Datta, Sophia Bote, Anaka Srinivas, Erin Fischer and Jay Jang. Also THANK YOU to the many parents who helped proctor and score for the meets! 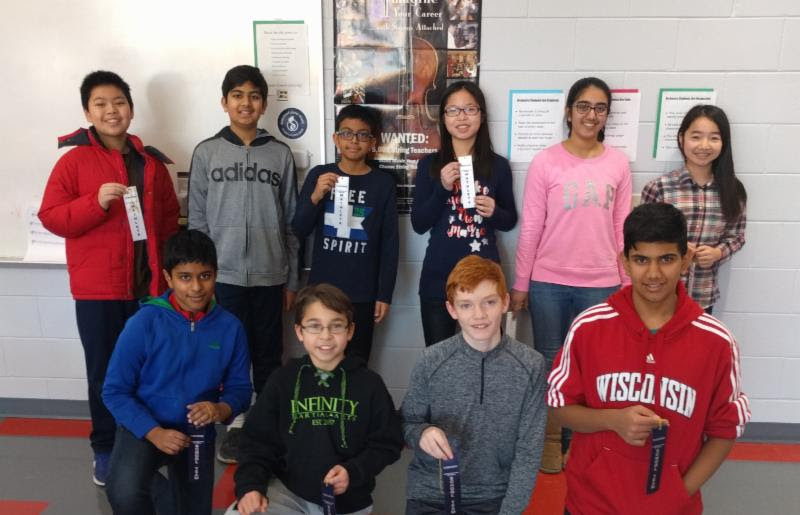 Congratulations to the middle level students who qualified for and attended the State MathCounts Competition which was held on Saturday, March 3 in Sheboygan. The team from Kromrey took 2nd place and included: Hansen Jin, Franklin Hu, Sanjay Suresh and Dheeraj Pasikanti. 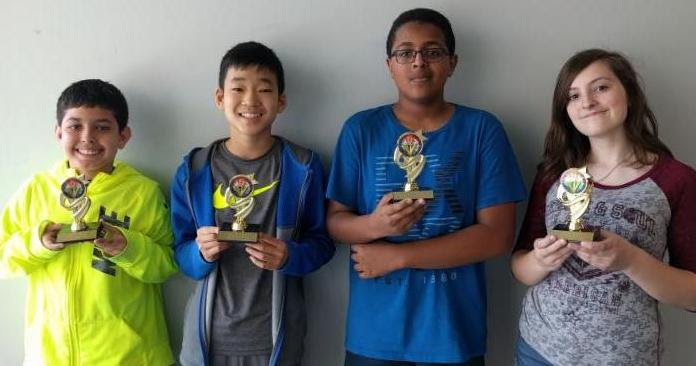 These kids also places as follows individually - Hansen Jin - 6th, Krish Parikh -20th, Franklin Hu - 21st, Sanjay Suresh - 27th, Daphne Wu - 29th and Amanda Zhu - 30th. Caleb Sander and Harsha Chilakapati also qualified for and attended this event. Special thanks to Abigail Ochberg for all her work coaching the kids this year! 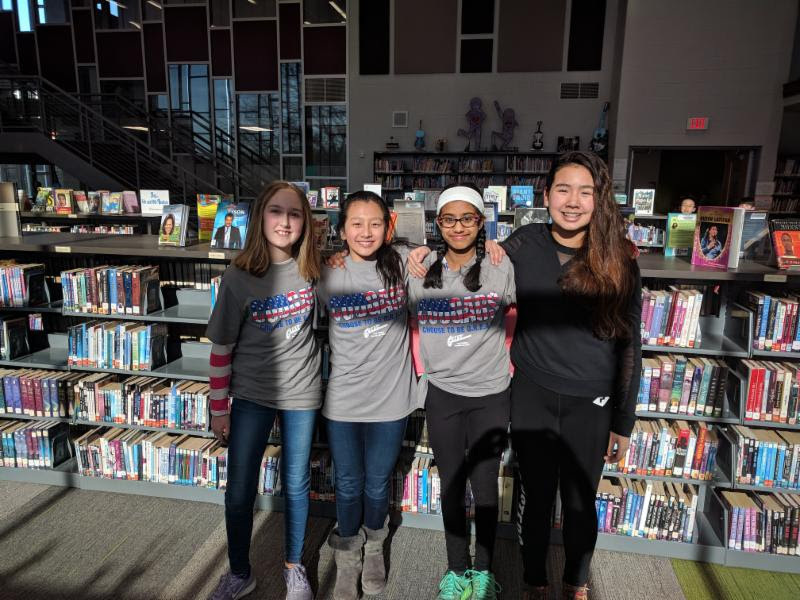 Two teams of students participated in the state wide Battle of the Books sponsored by WEMTA - the Wisconsin Educational Media and Technology Association. 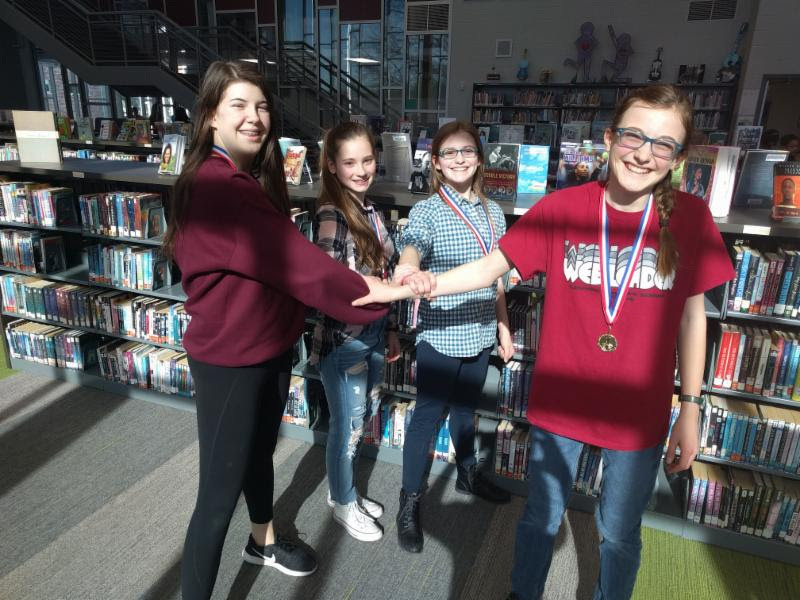 A team of 8th graders including Evelyn Anderson, Anastasia Leffel, Claire McLellan and Taylor Nordeng won the senior division at Kromrey and placed 2nd in the state! The other team of 5th graders won the middle division at Kromrey and placed 10th in the state. That team included Kevin Zhang, Owen Weisenberger, Harry Jin and Ryan Slattery. Great job! Kromrey held a Battle of the Books event last week, Friday, February 16. Our Battle of the Books is sponsored by WEMTA - the Wisconsin Educational Media and Technology Association. The statewide Battle of the Books program is designed to promote a love of reading among our students. It encourages students to read a variety of books and helps to expose students to different authors and genres. It is a fun, academic-based competition that has been very successful in school districts throughout the state in encouraging students to read. WEMTA sponsors three division - elementary, middle and senior. In our district, middle level includes students in grades 5 - 7, and 8th graders read the senior level books. The middle level participants read the Golden Archer nominated titles for the intermediate and junior high level plus ten other titles which are determined by media specialists throughout the state. The senior division reading list aims to expose students to current award winning literature. The list incorporates awards such as: Golden Archer, Newbery, Printz, Siebert and others. Eighty-eight students participated. 5th grade 1st place team- Kevin Zhang, Owen Weisenberger, Harry Jin and Ryan Slattery, 2nd place team - Ryan Zhu, Spencer Lyons, Kate Greenberg and Nebil Siraj, 3rd place 3 teams tied and those students include Vivian Liang, Katie Jiang, Eunice Chung, Keaten Davis, Gretchen Jones, Layla Raval, Samantha Kleinheinz, Lydia Paulsen, Zoey Zinger, Naomi Martin, Ben Zumbrunnen and Sam Raysbrook. 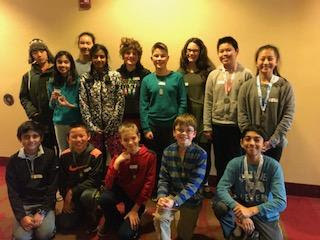 6th grade 1st place team - Alexa Garber, Grace Wu, Emily Dawson and Amritha Mavuri, 2nd place team - Owen Eliason, Thea Rohlwing, Isha Chilikuri and Netra Somasundaram, 3rd place team - Raghav Gopalakrishnan, Dima Llanos, Roddy McLellan and Koen Reiter. After the grade level rounds, we had a run off with the 5th, 6th and 7th grade team to determine the winning middle division team from Kromrey. The 5th graders won! So Kevin, Owen, Harry and Ryan along with Evelyn, Taylor, Annie and Clairewill do online competitions this week with hundreds of team from all over the state. All of the students did a nice job reading 20 books this fall and winter and working together as teams last week! Special thanks to Nanci Marshall and parents Evelyn Paulsen and Esther Kim for helping to run the events! 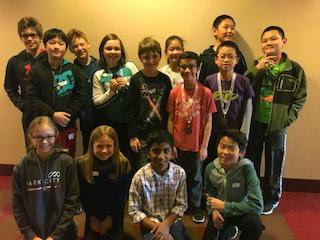 Good luck to the following students who placed in the top 10 at the District MathCounts event from Glacier Creek and Kromrey and will advance to the Regional Competition at UW on Saturday, February 3rd. Kromrey's team includes Hansen Jin, Sanjay Suresh, Franklin Hu, Dheeraj Pasikanti, Krish Parikh, Daphne Wu, Amanda Zhu, Michael Lee, Grace Wu and Rohan Kommuri. 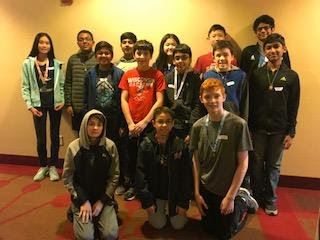 Glacier Creek team is Harsha Chilakapati, Caleb Sanders, Teddy Burkard, Aviral Srivastava, Kevin Wu, Aarush Gupta, Olivia Pan, Dhruv Prakash, Jahnvi Datta and Seoyoung Min. The Regional Spelling Bee will be held on Tuesday, February 6thbeginning at 6:00 p.m. at Stoughton High School. Good luck students! These students have been studying the topic of Philanthrocapitalism and will work in teams to analyze a set of challenges related to this topic. All students will be notified by the end of February if they qualify for the State FPS Bowl. Additionally all 7th and 8th grade FPS students wrote scenarios - short stories set in the future on one of the FPS topics for this year. Twenty-one of these scenarios were submitted to the State FPS Scenario Competition. 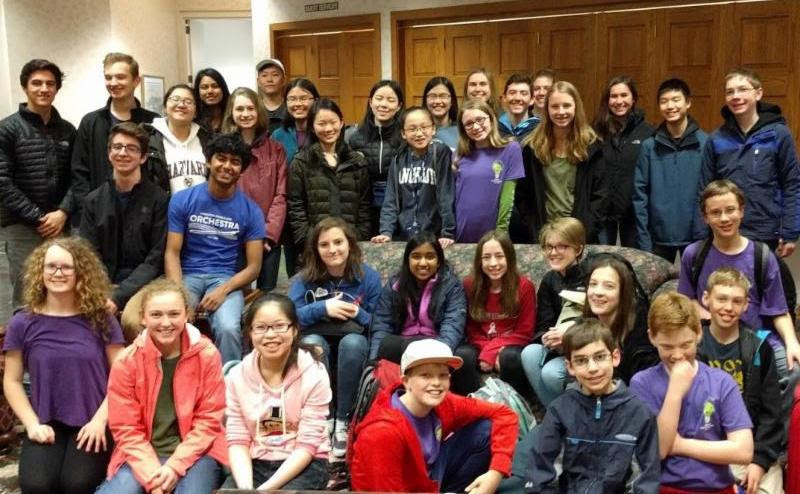 These students include Gus Balasubramaniam, Katy Bouril, Elora Doxtater, Sneha Chandrashekar, Abby Gessler, Erin Gonter, Aarush Jain, Lydia Hanson, Franklin Hu, Heba Haq, Elaina Jones, Kaitlyn Ko, Sophia Jorgensen, David Ma, Christie Munson, Sarah Mounajjed, Finn Patenaude, Warren Shepard, Daphne Wu, Zaki Siraj & Rachel Yoo. Excellent work! 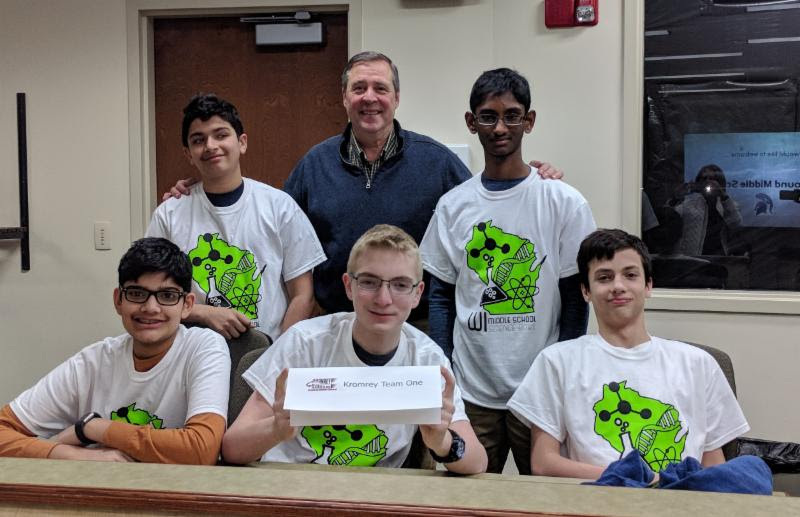 Five Kromrey 8th graders Rohan Kommuri, Aarush Jain, Sam Gustafson, Griffin McGrath and Sanjay Sureshr took the initiative to form a Science Bowl team this year. Science Bowl is sponsored by the US Department of Energy. These students participated in the Science Bowl on Saturday, January 29 hosted by the UW School of Engineering. The kids did a great job! Special thanks to 8th grade science teacher, Bruce Koeller, for all his work helping these students prepare for this event.